I recently wrote about the redesigned general conference section of LDS.org. In additional to the items I mentioned in that article, here is a great feature you may find useful. Suppose you want to provide a link to the story that Sister Marriott gave in the October 2015 conference about her daughter’s bike accident. In this example, the story we want to link to is in paragraph 17 of the talk. Therefore, immediately after the name of the talk, we add “.p17” (the number of the paragraph you want to highlight). At very end of the URL, add “#p16” (the number of the paragraph you want the user to be jumped to—the paragraph before the one you highlight). The image below shows how this link jumps to just before the story, and highlights the paragraph. Users can easily read it and also browse the rest of talk for greater context. Note: There is currently no ability to link in this way to highlight multiple paragraphs, just a single paragraph. One thing you might want to mention is how do they find out the number of the paragraph. If they were to actually count the number of paragraphs, they could get up to the number 9 but not 17. Just a suggestion. Is there a way to highlight a number of successive paragraphs? Or perhaps three or four different paragraphs in the same talk? Thanks. 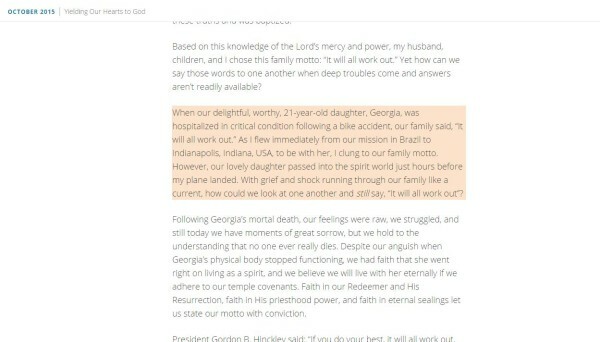 Following up on Steven’s comment, older LDS.org content let you highlight multiple verses using hyphens and commas, but it appears the newer General Conference content doesn’t let you. Is this a bug, or a limitation? There is currently no ability to link in this way to highlight multiple paragraphs, just a single paragraph. Might there be a fix in the pipeline so that successive or multiple paragraphs can be highlighted? Yes, a fix is coming. I also would like to know how you determined that is paragraph 17.